Oh yes, when you get a small spark of an idea popping up in your brain and wait a while, it starts growing and take a form. I was considering for a while of modifying the printer to a coreXY setup. 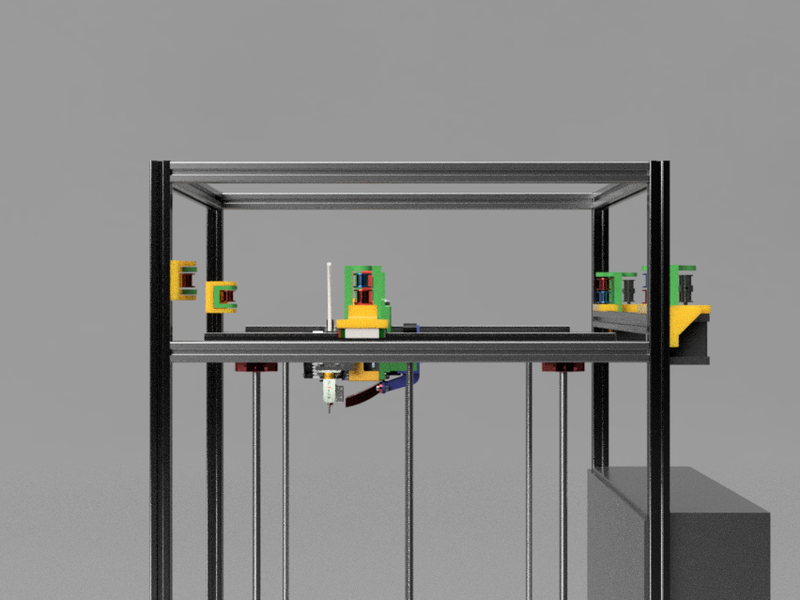 - front to be clear for the sake of accessibility (Probably I will install a horizontal 2020 extrusion somewhere in the mid-front. - larger electronics box : cleaner wiring, better cooling. Also extra space for the safety processor and extra power supplies (smaller 5V and 12V ones) for lighting. The Duetwifi gets also the expansionboard next to it for extra I/O. I chose to keep all the MGN12 rails and 2020 profiles for the rigidity. In the first step I didn't want to touch the printhead yet. So this part is almost the original one I use now except the connection for the belts moved to the top connector. Base plate and electronics box are in 6mm ALU. Since I want to see what's happening AND the Duetwifi has an onboard wifi antenna, the backplate will be in clear PC. This has been tested already and works fine. Idlers have bearings and fit on 5mm rods. I've printed a complete right side setup to check and I'm happy with the results. I may have a suggestion for "option 3" of your extruder motor mod (from the other thread). 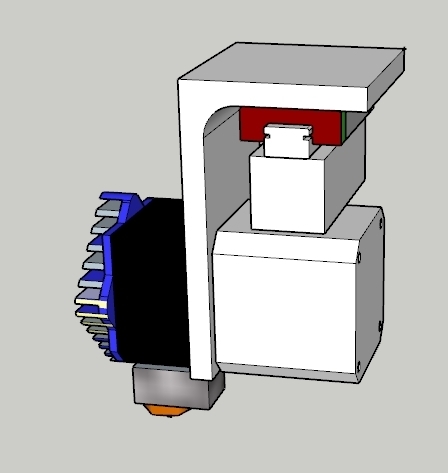 The first would be a Peltier cooler for the motor body with a heat sink and fan. I am not sure how well the fan itself would hold up in the heat, but it might be worth a try. Plus the relative inefficiency of the Peltier device would only add to the heat in the enclosure, which of course is what you are wanting. The second would be to add a small water jacket or just a modest water cooling plate to the motor and route small tubes outside the enclosure. You could even print such a thing (non-metallic) to keep its mass down, I would think. All the components such as water pumps, fittings and so forth are easily available and not expensive. You could run the cooling for the hot end throat using the same water loop. The nice thing about water cooling is that it would not take all that much flow and also there would be no added concerns about air flow inside your heated chamber. I think that would be interesting and relatively simple to try. I remember that we (Siemens) had pcb's with internal watercooling. I've been thinking about milling a snake-like pattern in thick alu with a cover plate. Getting that watertight is an other issue. That is why I suggested printing something. You could print it in ABS, vapor polish it almost to the point of it melting (to seal any gaps), do a final flat sanding (600 grit paper on a mirror tile) and then bond on a thin aluminum cover plate with silicone RTV or super glue. It would not be necessary to run it at much pressure to achieve a good flow. That would keep the overall mass at a minimum and you could be very creative with the internal passages. 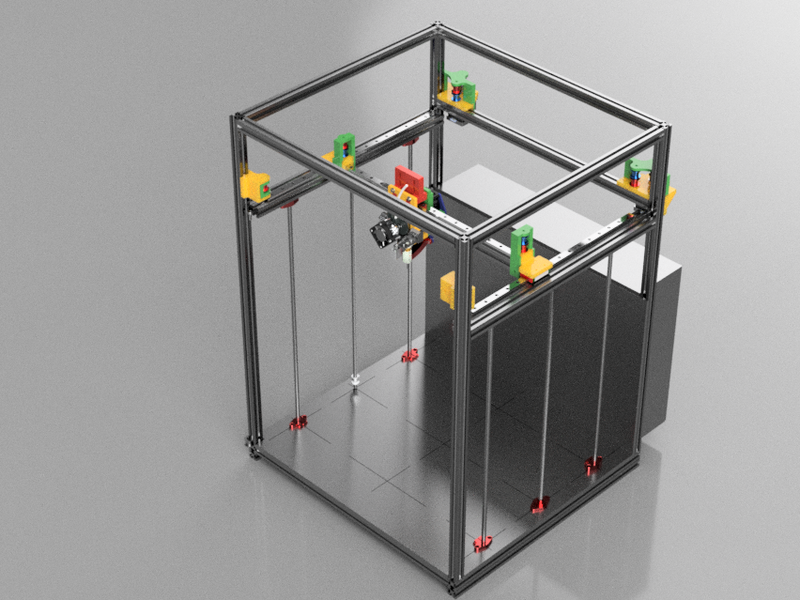 @Walter, when you do this modification, what are your plans for the frame and build plate sizes? With the Y-rail relocations, that X beam would have a longer span, and it also forces you to use a longer span for the bed carrier on the Z-axis. Not critical problems by any means, but it does give more opportunities for bending/warping/twisting. I've thought about this too with my FT-5 plans. 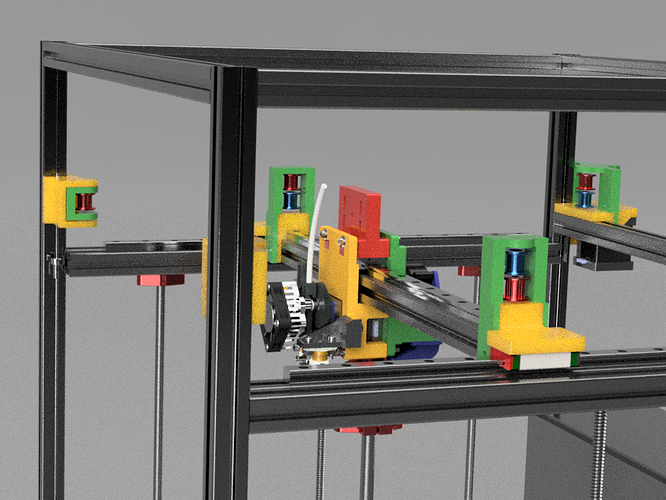 As designed, the FT-5 needed a larger footprint for the Y-axis, as the steppers needed to fit past the rails on one side, and the idler pulleys past the rails on the other. The linear rails themselves are what, 400mm long? So everything is conservatively large for the 300x300mm build plate. It seems to me, that with some clever positioning of the motion components (like you have done), a 400x400mm build plate is a very real possibility. Likewise, you could build what is effectively an 80%-scale FT-5, and still retain the 300x300mm build area, but gain some rigidity (and reduce moving weight) from reducing the spans. Of course, that's the point where I told myself I was no longer modifying a FT-5, but in fact building a different printer. Yes that one will be larger. And I'm happy with that. Bed rigidity is not an issue. I used Alu L-profiles now (see in one of my previous modification threads for some impressions. I will do the same for this one. Initially I will just extend the sides. Then I will think about a larger bed which will require a larger heater too. The steppers that I'm going to use are the largest Nema17 ones I could find (60Ncm and 2.5 amps). The Z-stepper will be the old original one. But driving 2mm lead leadscrews with a 32 tooth pulley (20 tooth on the stepper). I don't expect more issues then I have now with the bending/warping whatsoever. The beam will be 460mm instead of 410mm.And that brings the 400 mm effective print surface within reach. Will likely start a new thread when time permits, but I saw the first two pictures @Walter posted and had to smile ( and write this post). I have been busy on a few other projects. More important but less fun! Very Cool Walter! Look forward to seeing you progress on this project. I was really hoping that 3D printing would be another tool to fuel my true passion high power rocketry, but I just can't leave the darned thing alone! Also, very nice modeling! Fusion 360? If it is, any tips or references for modeling the extrusions? I couldn't figure out how to only model one profile and reuse it like I can in Solidworks. Once you have the sketch and made one extrusion, you can easily push/pull to get any length you want. I made and saved a couple for the lengths I need. Do you save them as separate parts? Or are they all contained within the main model? This is one of the things I have a harder time wrapping my head around coming from Solidworks. I was going to do that but decided instead to do a dual linear bearing setup on each corner guide rod. It was super easy to install and is now extremely "stiff" side-to-side and front-to-rear. In combination with the two belt-linked acme screws, bed tilt just isn't an issue any more. If your setup is binding, there is something else wrong, such as the holes in the plates being out of line or the rod end clamp blocks being offset from one another. Mine doesn't bind at all, despite still being attached to melamine. But I didn't assemble it quite as described in the manual either. Thanks for the reply and sorry, didn't see your post for several days now. Yes, something else is wrong: the melamine was warped and would never be straight. So now as I go to all aluminum, at least two of the six vertical members that attach to the build plate were not needed. Pics to follow, I promise! * First of all, I used a spacer tube to align the Y carriage plates to the base plate rather than spacing them from the top rails. So they are very parallel to the base. * With belts unattached, and all the vertical rod attachment blocks and bearings loose, run the platform all the way to the bottom. * Tighten the lower blocks and bearings snugly but not to final tightness. * Run the platform all the way up, do the same at the top. * Run it all the way down and tighten everything completely. * Run it to the top and do the same. * Test for binding through out the entire range. * Install the belts (I have three) and ensure that the platform is still parallel to the base plate. When I installed the double bearing setup I am running now I just slid the corner rods through the base plate, added the bearings, slid the rods back, and tightened everything up. No realignment was necessary and if anything it runs even smoother now. Can you share some more details (maybe a pic) of your double bearing setup? I have been having issues with misalignment between both sides of the z axis lately and am trying to determine the best way to eliminate it. I've printed parts to link the 2 z motors using double sided pulleys and belts, but waiting on the parts I ordered before I can install. 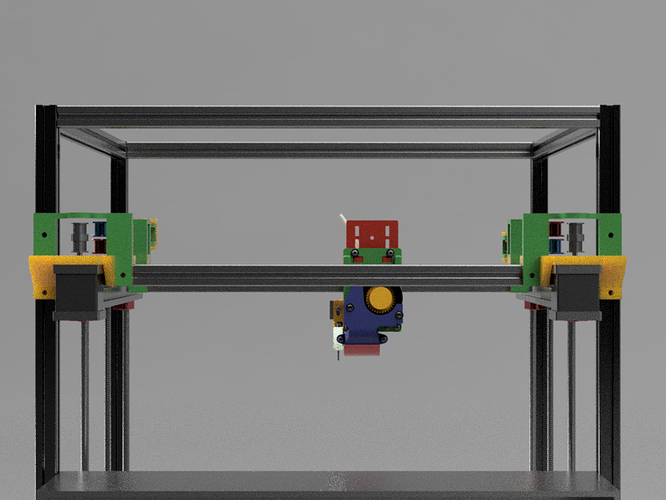 My thoughts are that linking the two z motors physically should help mitigate the misalignment, but if the bearing setup you've described can help further, then it is certainly of interest to me. Three of the four corners look alike of course, so I have only included a photo of one of them (right front) and also the right rear where the Z home switch is. The synchronized Z motor setup was (and is) a must so far as I am concerned. However the double bearing setup is icing on the cake and it really did make a noticeable difference. You will need slightly longer screws to hold the stacked bearings together, but other than that it was painless to do. The added bearings are simply duplicates of the ones already present at the corners. You can get them many places (including FolgerTech) but I bought mine from RobotDigg as part of a larger order some time ago. The whole upgrade cost me maybe $12 or $14 (I forget, I bought them almost a year ago). Great! Thanks very much for the info! Looking at the pic I can see the impact a setup like this has in reducing the tolerance for off axis movement of the linear rods. I would think that with this setup, the lead screws would bind before the two sides could get far enough out of alignment with each other to cause issues with bed adhesion, or thin spots, etc. It sure will be nice to not have to fiddle with the leveling screws on my heatbed at the start of pretty much every print lol. Hey @Ron, just curious, what is the benefit of having the large knobs and such easy adjustability of the Z-axis endstop? I was under the impression that the Z endstop needed to be rigid and precise, but was otherwise only the "coarse" adjustment for the bed... and that the fine adjustment was instead handled by adjusting the spring-loaded screws on the corners of the heated build plate? Is it to make things faster to recalibrate when you change nozzles? I rarely have to touch them these days. 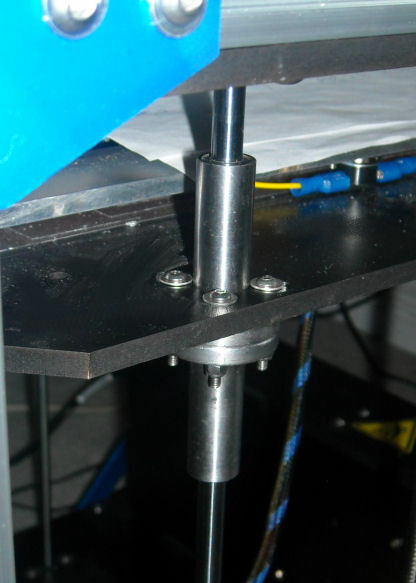 The effect of the double bearings is to increase the "stiffness" of the plate alignment by a lot, particularly in the front-rear axis which otherwise is actually not very stiff at all. 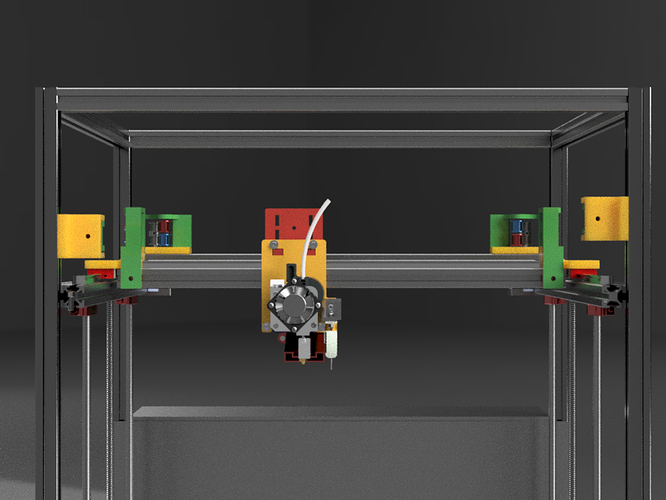 Although the lead screws probably would bind, the rods could still flex, so again synchronizing the two motors and lead screws is a must so far as I am concerned. 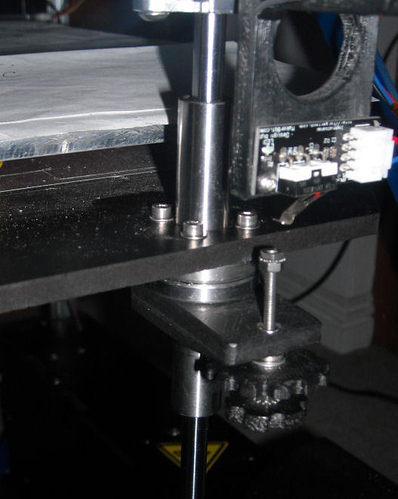 The belt setup takes care of the left-right leveling. So between the two things the bed stays level. It takes very little misalignment to mess up first layer adhesion, BTW. The large knobs do indeed make adjustments very easy. I struggled with smaller (or no) knobs for a while and finally just printed up the ones shown in the photos. As for fine adjustments, well yes and no on the bed springs. Once the bed is leveled it is preferable not to mess with them (especially if you have the belt and bearing setup I have so everything stays level). So the end stop for Z becomes "the" adjustment that controls height. Using these knobs I am able to tune in very fine changes if needed. And yes, it also makes things easier and faster when I change nozzles or build surfaces. I know that you are supposed to be able to do changes of that sort through the display, but for whatever reason the Z offset setting doesn't work effectively on my printer. So I just tweak the height as needed using the knobs. It is faster and easier. 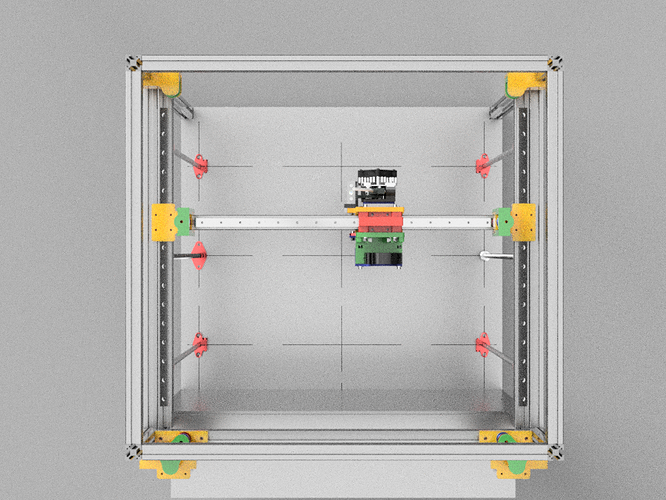 Here is my quick (and in fact not so dirty) solution for printing missing parts or other stuff while I'm modifying the FT5 to coreXY. What I learned however is that when the CPU fails (it's becoming very hot), all the MOSFETS on board are conducting = heaters are heating, partcooler is working full power. That is a dangerous situation when this happens unattended : meltdown of the hot-end (!!!) as this isn't controlled anymore! But here is a picture. I'm expecting a new MKS GEN board and after that : disassembly of the FT5! Bed heats to 85°C in 6 minutes and printer is meant for PLA and PETG, no weird stuff for this one. 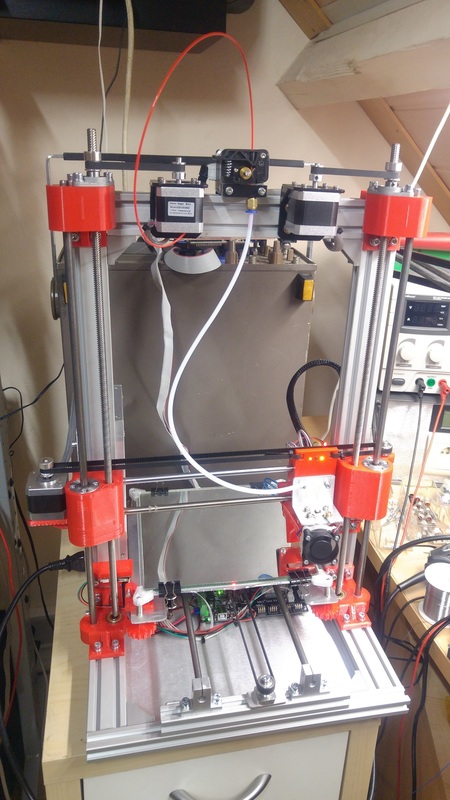 If you are changing so much with your FT-5, did you ever consider building ... another FT-5 instead ... and keeping your first FT-5 as your parts printer?